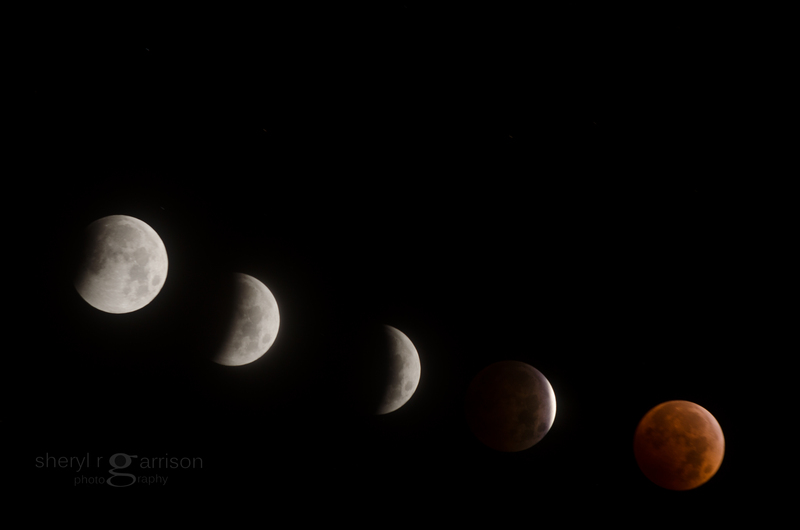 Last October I got up in the early hours of the morning to photograph the total lunar eclipse and this one was going to be pretty special as it would culminate in a blood moon. A lunar eclipse occurs when the full moon passes through the Earth’s dark inner shadow. The Nikon D 7000 has an image overlay feature in it that I was anxious to utilize to capture the whole process in one RAW image. I knew that I would have to visualize where each moon was going to line up so that they could be spaced across the image. Why not just use photoshop? Simply put…I like a challenge. The set up involved a tripod and I also like to use a remote trigger to eliminate movement. What I found was that I did have to keep repositioning and refocusing the camera as the moon was dropping fairly rapidly between each phase. I also needed to adjust exposure times for each phase as the light changed dramatically. This was the final image from my camera after combining these five separate images using image overlay. I was pretty happy with the end result and only had to tweak highlights and blacks and remove a little chromatic aberration in Lightroom. Before sunrise on April 4th there will occur the shortest total lunar eclipse of the 21st century…it will all take place in less than five minutes. I hope that today’s post will inspire you to get out and shoot the moon. Fingers crossed for clear skies and I’ll be right there with you! For more information on all things sky check out Earthsky.org. Beautiful pictures and quite a challenge you have issued.I do not think my point and shoot is up for it.